This IASSC Six Sigma Black Belt is aimed at experienced process improvement teams who want to progress their skills and expertise. Here, we combine practical learning with intensive exam preparation. It is an ideal programme for in-company training delivery. We provide the training in instalments, working in harmony with your team’s busy schedules and allowing time for study and application between modules. We also offer this black belt programme for individuals to attend. Our public IASSC Six Sigma Black Belt course runs twice a year. What are the benefits of running an IASSC Six Sigma Black Belt programme within my organisation? If you’re an organisation that already operates process improvement, or if you have a number of individuals who work on streamlining and improving how things are done in your day-to-day business, black belt training and certification can take your savings and advances in productivity to the next level. Our IASSC Six Sigma Black Belt programme includes 15 days intensive classroom training, SigmaXL software for each participant, all course materials (both physical and online), and costs for exam and certification. Those who are experienced with Lean Six Sigma and process improvement may have reached their potential at a certain level. Completing Black Belt training will present them with new challenges and perspectives, and a renewed sense of enthusiasm. IASSC (the International Association for Six Sigma Certification) champion best-practices in implementing six sigma on a global scale. As an Accredited Training Organisation (ATO) for IASSC, we train to these standards. Our black belt programme meets the IASSC requirement for a minimum of 140 hours through a combination of classroom-based training, self-directed study, and project work. In-company training is extremely effective, and an excellent choice if you have a number of people who require black belt training. We come to you to deliver training at your premises, or a venue you choose. This cuts down on disruption to the trainee’s productivity, and eliminates travel costs. We will also run each instalment on a date that works best for you. For example, scheduling training at your busiest time of month would be counterproductive, so we’ll work with you to find a time when each participant can attend easily. The ideal candidate for black belt training is someone who has a lot of experience leading and working on process improvement projects. If you are unsure about whether your team fit that requirement, why not give us a call on Freephone 1800 910 810 to get tailored advice? Are there any eligibility requirements for this programme? Yes, this programme is suited to those who have worked extensively with process improvement in the past. 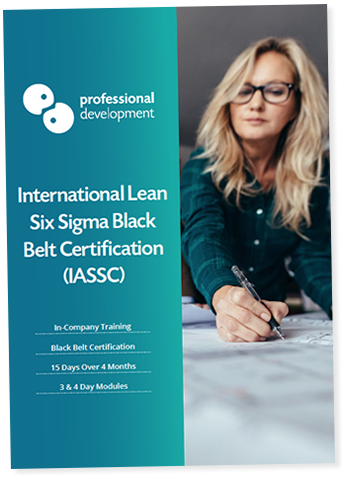 You can read the detailed eligibility requirements for this IASSC Six Sigma Black Belt programme in our brochure. If your team is new to lean and six sigma, why not consider Green Belt training? You can learn more about our Certified Lean Six Sigma Green Belt for Business by clicking here. How is the Black Belt certification achieved? There are 2 elements to achieving this Black Belt certification. Throughout the training, each participant will work on a project. On the last day, of the programme, each person makes a presentation on their project work. 8 weeks after completion of training, all projects are submitted for assessment. Block out study time to prepare for sitting the IASSC Black Belt examination. Once you are ready, schedule and complete your IASSC examination to gain the certificate. Can I attend this course as an individual? Yes, this IASSC Black Belt programme is open for individuals to attend. We run the full programme twice a year in Dublin. Click here to learn more and request our current schedule. If you want to enquire about scheduling a black belt programme in your organisation, the best place to start is by consulting with our Director of Training. All elements of training, and requirements you may have are discussed before we send you a detailed proposal. You can reach us by calling Freephone 1800 910 810, or clicking below to ask a question or get an in-company quote.